Weight benches are equipment that appears like a normal park bench but instead are designed for use in body weight training. These benches come in different designs, they could be fixed horizontal, fixed in a folded position, fixed inclined, with racks to hold bars and so on. Weight Benches can be used in combination with other equipment to give a more complete exercising experience. These benches are manufactured by different vendors and they come with different features, qualities, and prices. Below is a review of 10 best weight benches. 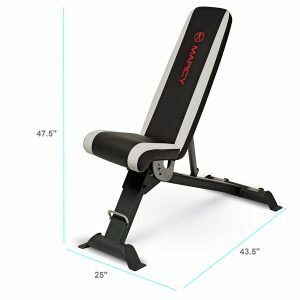 If you are in need of a dependable and reliable gym accessory, then the Adjustable Utility Bench from Marcy is your surest bet. The bench is apt for people who are into different types of exercises aimed at building the muscles in their chest, back and shoulders. The bench is produced from premium-quality materials which guarantee stability and long-lasting use. Regardless of if you are engaged in light or intense workouts, this bench helps to keep your body sufficiently secured and supported with its powder-coated steel frame. It also features a two-tone upholstery and high-density foam. The back pad is not only adjustable, it is highly adjustable as well. It could fit most half cages, squat racks and Smith machines. The machine comes with built-in transport wheel s and a handle grip which helps to make moving it around much easier. This bench is ideal for exercise at home, in the gym or in any outdoor exercise area. Storage of the bench is also easy, as it can be folded flat for easy storage. The bench allows you to sit, kneel or lie down when you perform lifts, presses, and curls allowing you to shape your body in the way that you want it. This bench is made from the premium quality material. It comes with a powder-coated steel frame that has a high-density foam in black and white upholstery. This helps to keep your body secured and supported during intense or light workouts. 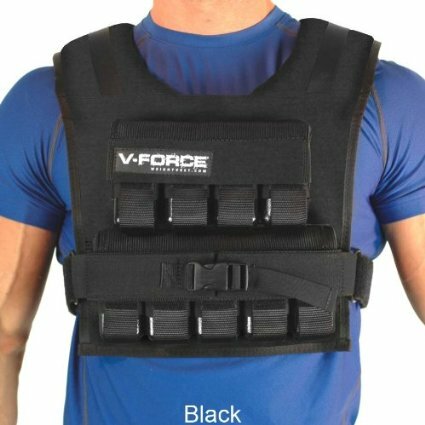 The back pad is adjustable and can be set to different angles to perform chest exercises such as decline, incline, military, and flat presses. The tilting seat can be adjusted to three positions to fit users. The bench is adaptable to fit the most machine. It can be attached to Smith machines, half cages, and squat racks to get the most of your workout. The frame has a solid construction. It is built with a 14 gauge steel which helps to keep it sturdy while in use. In order to protect the steel against rust and scratches it is powder coated to finish. The seat cushions and backrest are boxed upholstery which is made of top-grade high-density foam for comfort and support in order to reduce muscle fatigue. It comes with a two-year manufacturer’s warranty. The GDFID225 Weight Bench from Body-Solid comes with 7 easy to use with full security ladder type adjustment position for the decline, incline, and flat workouts. The bench is durable thanks to its commercial grade 2″ x 3″ steel construction. This also helps it support the heaviest kinds of workouts. It comes with built in wheels which helps to make transportation quick & easy. There is also features a pull pin which allows the weight bench to fold completely for easy carrying and storage. The weight bench comes fully assembled from the box, eliminating the need to have it assembled. It is very light and mobile. The actual weight of the product is just 54lbs. Some users have observed that the bottom seat pad is stationary, which means it does not tilt up when doing incline presses. The Bowflex 5.1 is an incremental advancement in versatility and quality spectrum. 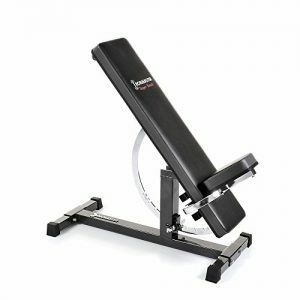 The reflects the best in Bowflex design and emphasizes the full range of exercises associated with the best FID benches. The bench is equally excellent for correcting posture and ensuring you are well positioned for a safe, muscle-building free-weight workout. It is built very strong and to last because of its heavy-duty commercial quality steel and durable upholstery. For an added decline position support, the bench comes standard with a removable leg hold-down brace. It comes with wheels, which allows for easy storage. The Bowflex 5.1 is an excellent option for those looking for either a great workout exercise bench that can go under a Smith machine bar to perform barbell workouts or another one which supports many other weight training exercises which can be done without dumbbells. The bench is strong & stable, thanks to its solid steel frames. 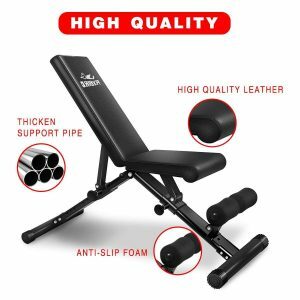 In order to make sure that the weight bench does not become wobbly when doing sets and reps, the bench comes with a solid frame design and has a raised base support. 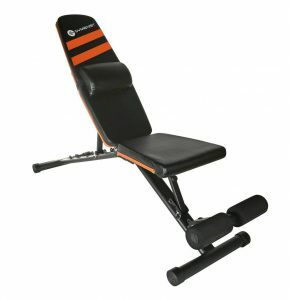 It also comes with a well-padded seat and backrest which ensures comfort during a full workout session. The seat of the bench has a modern design plus a padding contoured which helps to provide better quality support for your legs compared to low price weight benches. It comes with a quality locking pin which allows you to lock it into a particular position during workouts. The Bowflex 5.1 is similar in many regards to the 3.1 model. However, the key difference between them is within regards to benches seat positions along with back support. The 5.1 bench comes with more seat positions & back support positions than the 3.1 model. While the 3.1 model only comes with include, decline, vertical, and flat position, the 5.1 model comes with 2 extra settings for incline; 30 and 60 degrees. 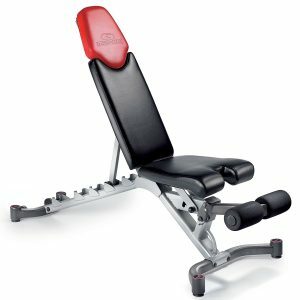 The Bowflex 5.1 bench has 6 different positions; -17◦ declines, flat, 30◦, 45◦, 60◦, and 90◦. These six different seat angle positions allow you to be engaged in different types of exercise to build your body muscles. While working out on the incline, the seat can be adjusted in 2 different positions easily, helping you to workout efficiently. The more supported you are, the more effective and efficient your workout will be. Bowflex 5.1 weight bench comes in dimensions of 56″x26″x20″, which equals the size of the 3.1 bench. This means the weight bench will occupy some extra space in your home gym besides that the bench is also heavy, weighing at around 66lbs. But it comes with built-in wheels which makes movement quite easy. 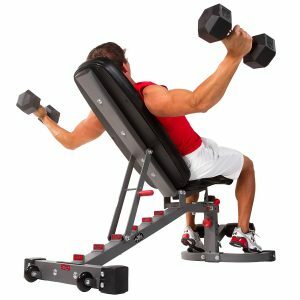 The Bowflex 5.1 is a heavy duty bench with good durability. It seems to be made form a good quality steel and upholstery materials. Maintenance is equally easy as it only requires that you clean it with a cloth after the use. The padding will not rip apart or get teared easily, as it is as sturdy as possible. It can only get wrinkles from daily use, making the bench looking older than it really is. When the bench is in flat position there is a gap between the seat and backrest, causing some form of inconvenience. The wheels of the bench sometimes lock up causing a challenge to move it around. The bench is quite long. Some people consider this length a problem. The XMark Weight Bench is unique in its nonsense function above every other thing. It is a wound purpose-built tool built to last. The design of the bench is a product of its function and build quality. This makes them have a lot in common with heavy duty cranes. The bench is designed with a maximum weight capacity of 1500lbs. It comes with 7 back support positions, ranging from decline through to upright with a variety of other incline settings in between. The XMark Fitness 11-Guage Bench can be used for dumbbell workouts. 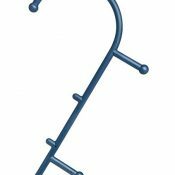 Also, its commercial grade weight capacity allows you to slide it under a power rack or smith machine to perform more intense barbell workouts. The seat and back cushion is made from an extra thick 3″ duracraft pad with sweat and tear resistant duraguard vinyl cover. It comes with built-in wheels which allows easy movement and storage. 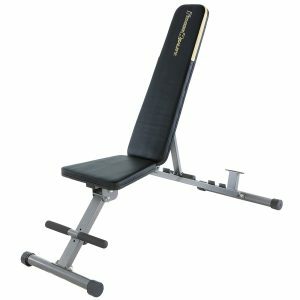 If you are in need of an ergonomic adjustable weight bench which requires no assembly, then this bench is worthy of consideration. The bench can be carried to different places with relative ease since it is foldable. It can also be adjusted to different levels which includes decline, incline and flat positions. These encourage intense workouts making it simpler to achieve the best results. The bench comes with a free cushion which is designed for the back. The cushion can be moved easily up and down to favor different sitting positions, hence providing additional comfort. Aside from this, the seat can also be moved in three different positions. It is a reliable and convenient weight bench and an affordable choice for your budget. The bench can be folded flat to become half its original size. This makes it great for storage and also can be moved around with relative ease. It supports weight of up to 550lbs, making it great for home and commercial use. The bench is highly adjustable. The pins can be used to adjust the back and legs of the bench to adjust to whatever position you feel. The back of the bench can be used in six different positions while the legs can be adjusted to three different positions. Some customers have complained about the locking pin being annoying to take out and put in after adjusting the bench, compared to adjusting with notches that is obtainable in other benches. If you are in search of a robust workout bench capable of allowing you lift heavy weights, which can be adjustable to different levels and still can be stored easily, then the Fitness Reality 1000 Super Max Weight Bench is one of your best bet. This bench gives you all of the above and what’s more is that you don’t have to dig deep into your pocket to get it. It is a professional home gym equipment that offers the full functions and features that you will require to have perfect strength training in your home. The bench is built to last and has the capacity to hold weight of up to 800 pounds. The front legs comes with two adjustable positions which will extend the number of backrest angles to 12. The bench will help to improve your upper body workout and is apt for dumbbell and most other strength training exercises. Compared to most other equipment with the same price range, this bench has a much higher maximum load capacity of 800lbs. This makes it suitable for anyone regardless of how heavy they are or how much weight they wish to lift. The high weight capacity is also a sign that you don’t have to bother yourself about breakage. It is a very durable equipment. The Fitness Reality Bench is an FID bench which means the backrest can be set to flat, incline or decline positions. In such cases, it supports 12 positions from -20 decline to 80-degree incline angles. This will allow you to get more exercises done and you will be able to focus on the development of one particular muscle group better. The 80-degree decline is very important as it allows you to perform exercises that require stable sitting and back support. The bench also comes with a 3 position leg holder. This has a beneficial function since by fixing your feet there you will keep your position and ensure a proper posture while you continue your exercise. The leg holder also allows you to use this workout bench as a sit up bench. Therefore, this will allow you to perform different abdominal exercises such as decline sit-ups, Russian twists and much more. This weight bench is foldable allowing it to be an excellent choice for people that have little space at home. After folding, the size is 51Lx23.5Wx9H, allowing it to be stored easily under the bed or in a corner of the room. Also, it comes with transportation wheels, allowing it to be moved easily to where you want. Just like most other Bowflex products, a lot of thinking goes into the Select 3.1. It looks exceptionally great. It has a very simple design but looks like a bench that may cost more. It is a hallmark of FID bench as it adjusts to 4 different positions, one of which is an intermediate position between the horizontal and vertical. It comes with foot restraints used for ab work. The restraint setup can be removed easily if that is what you want. It comes with a firm and comfortable saddle and the bench can be folded quite easily and wheeled away to storage. The bench can adjust to as much as four different positions for more than 30 different exercises. You can convert any free space into a personal weight fitness center. 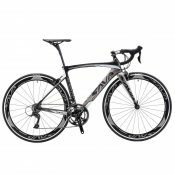 The frame comes with a 15 years warranty while the upholstery has a one year warranty. 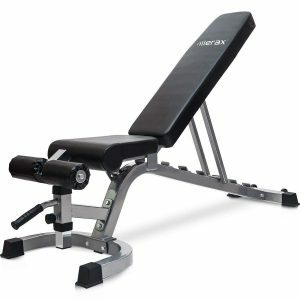 Merax Deluxe is an adjustable utility weight bench which can be used in different positions such as decline, incline, and flat positions. The back pad and seat can be adjusted to different angles so your body parts can be hit at different angles. The bench is built sturdy and solid and is apt for both home and light commercial use. The design makes it easy store, foldable, and it comes with transport wheels which allows it to be moved out of sight and you want it out of the way. It can easily be folded down and up in just a few seconds. The bench is marketed as a FID and ab incline utility bench used to perform a variety of exercises at home. It appears excellent in black, comes with a sturdy steel frame and dense foam padding wrapped in vinyl. It has a maximum weight capacity of 800 pound and measures 60″x22″x50.4. The upholstery is in the highly durable vinyl material which gives it the capacity to last for many years. The bench is also formulated for easy maintenance and water resistance, allowing for easy wipe downs after intense workouts. It is a low-profile barbell bench constructed with quality and heavy-duty tested steel which makes it capable of handling the heaviest loads of up to 800 pounds. This provides solid support for you and you weights during any heavy lifting sessions. The bench can be adjusted to six different angles ranging between flat, incline and decline. This will allow you to get the exact workout that you need. Aside from that, it comes with four different base seat adjustments for users with different heights. It comes with a dense foam padding used for a soft form surface apt for long periods of sitting or doing involved exercises to develop the core, chest, back and more. Compared to other adjustable benches, this bench is a lightweight model and offers great versatility. It is about 30 pounds, making it easy to be dragged from one place to another without much qualms. This highly adjustable exercise bench features a sturdy construction, has a versatile position the both back pad and seat, and upgraded assembly that needs only just four steps to set up. It comes with a detachable leg support which can meet your any of your varying choices. 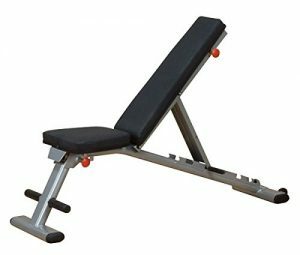 The bench solid design and reliability offers users a variety of features and positions, particularly when it comes to its weight lifting program. The bench helps to maximize the size and overall shape of your biceps. Through the immobilization of your upper arm, the bench forces your bicep to work in isolation, pushing the muscle fibers to work to capacity. It comes with a stowable feature which helps save 50% space when it is not in use. It features a high density foam padding which helps to stabilize the body during exercises and reduces muscle fatigue. You can perform a number of workouts using the bench. You can work on biceps, shoulders, legs, back and the chest. It has a significant weight capacity. The maximum capacity of the bench is 600lbs. This allows you to move huge amounts of weights. It is constructed with heavy steel, meaning it will last for a long time unless of course you are an extreme bodybuilder and are pretty rough on the bench. The bench can be used for both spring-loaded moves and free weights with its various combination of set-ups. The bench is adjustable, durable, very thick and comfortable due to its Durafoam technology. The Ironmaster Super Bench is a commercial grade equipment that can be used by even the strongest lifters to carry the most hefty weights. It is stable, highly adjustable, comfortable and durable, offering an excellent workout experience for virtually everybody. 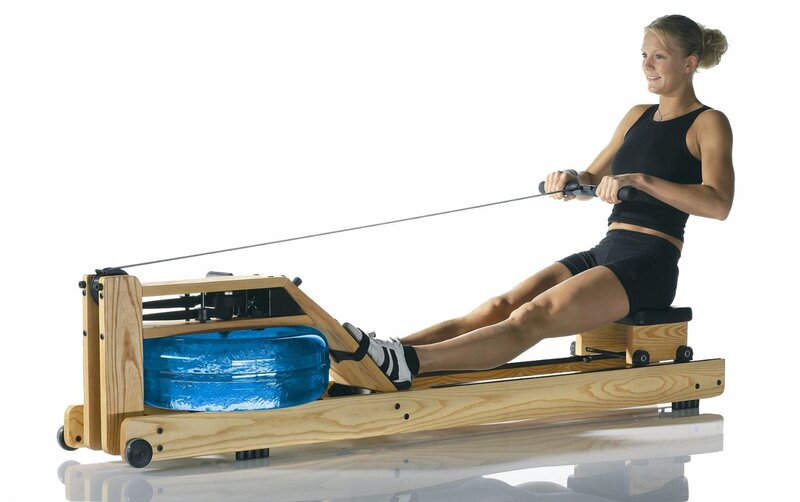 In flat position, it has a maximum weight capacity of 1000lb while in incline and decline positions it is 600lb. This max load capacity is more than okay for even the most serious lifters. In both positions (incline and decline) it can be easily adjusted in 11 levels. This allows you to set the angle for your own needs as much as you may want it. You can do military presses quite easily as it supports 85-90 degrees. The seat is removable, offering a stable sitting area. You don’t have to worry about slipping forward as the seat is perpendicular to the backrest. The backrest is thickly padded to give extra comfort, plus it is long enough for tall users. The IronMaster Super Bench comes almost completely assembled, all that is left is the feet. Once it arrives, all that is needed is for the feet to be installed and for the four bolts to be tightened. The crunch attachment may require assembling, but that shouldn’t take you more than 10minutes. The bench is made from a combination of 11, 12, and 13 gauge tubing. The critical components are even beefier, e.g. the notched adjustment wheel is 2-guage steel. The bench comes with a multitude of adjustment angles ranging from 0◦, 5◦, 10◦, 20◦, 30◦, 40◦, 50◦, 60◦, 70◦ to 85◦. You will have absolutely nothing to worry about in terms of exercise variety. You can perform bench press, military press, incline bench press, and overhead press at different angles. The quality of the equipment is one of the most important factors that you must consider before buying a weight bench. 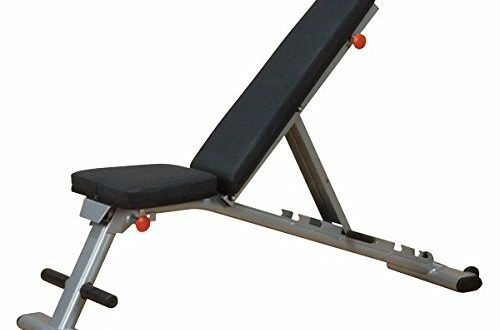 A cheap low-quality weight bench will start to wobble only after a short time of use. Aside from this, it is also unsafe for heavyweights, too. It is smart economics to invest in an equipment that has an excellent build quality. It is important that your weight bench has a broad range of workouts with different angles such as flat, decline, and incline. The best adjustability weight bench offers between 4-6 preset positions. This will allow the targeting of different muscles efficiently. The greater the options of adjustability, the more efficient the workout, thus helping you build more muscles. Weight bench comes in different styles. Those that don’t have rack are called utility benches. They are easily adjustable. They are also less expensive and often can be used with dumbbell exercises. They do not need much hardware to setup. Portability is equally an important factor that is worth considering. 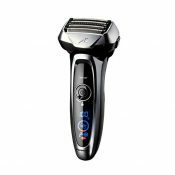 If you plan on using this equipment at home then it is better you go for one that can be moved quickly and effortlessly from one place to another. Padding should not be neglected or look down on. 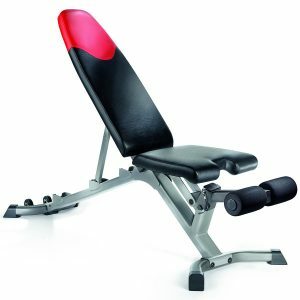 The bench must offer a safe seat and back padding, this will give a comfortable position for you and will offer support when you are working with heavy weights. Many people do not take this factor important but reading customers review can go a long way in helping your purchase. By reading the reviews of people who have used a particular bench, you will have a good idea about the pros and cons of the equipment. You will be able to examine the personal experiences of users and get a good understanding of how the bench works. This is one of the key benefits of these benches, they help to provide the support which is needed to lift heavy weights. They do not break or buckle under the strain. The strength and stability of these benches give users the confidence to focus on muscle building without having to stress about losing balance or control during the movement. One of the most difficult but beneficial movement is the Hyperextension but this can be easily practiced on gym benches. This movement is particularly important for improving core stability, posture and the strengthening of the lower back muscles. You can target the rear deltoid muscle more easily in a sitting position than when standing. This is because the body gains more stability while in a seated position. Majority of the benches can be utilized in different positions than just weight lifting. They give you the option of purchasing additional accessories so you can perform crunches, chip ups and much more. This is certainly a wise investment for your home gym because you will get more for what you pay for. Most people wish to build a defined tone in their upper body and benches help to achieve that. This will help lead to a reduction in your body fat, which is excellent for the joints. Your bones will also be better for it as these exercises helps increase bone density and increase flexibility. These benches are quite excellent for beginners. They help you learn and maintain a proper form to ensure safety. Painful injuries can result if exercises are done using a poor posture. What is the benefit of using this equipment? This is one of the important questions that you need to ask before going ahead to purchase a weight bench or any other exercise equipment. Your bench must be able to play a role and get rid of something. If not, your home, or fitness center will look like a used equipment warehouse. When you are serious about purchasing benches then you must read through trade magazines, visit the vendor’s website etc. 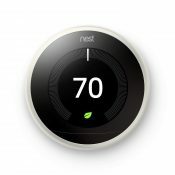 You must determine what they are doing, what their themes are and how their equipment will look in your home or center. This is very important particularly considering the amount of cheap low quality stuff that is available on ebay and other ecommerce stores. Give a good thought to what and how will be lifting and make sure that the bench you are about to buy is strong enough for this weight. Ensure that you ask about the weight rating of the equipment before you purchase. Is it nice and heavy and stable? You do not want a poorly constructed bench press that is going to start wobbling anything you press the weight. It is quite unsafe to use such bench. While exercising you want your mind completely focused on the job and not on the status of your improperly balanced bench. What is it? For how long? What does it cover? This will not apply if you are buying a used equipment but if you are buying new while shopping, you must check for warranty. Even if you are not buying new, you must check for structural rust that may weaken the bench and cause it to fall down under weight. You must ensure that your facility or fitness space at home can boost of high-quality benches. This will go a long way in improving your mainstream clientele and improving the quality of your exercises. The aim of this post is to maximize the result of your bench press training. You can go ahead and start using the review and tips to find and use the best weight bench in 2019.